The New Yorker reported yesterday that Haiti has chosen an interim president to rule over the collapsed state after a week of political impasse that saw the possibility of full-blown social chaos materialize. Before leaving office on the 7th of February, former President Michel Martelly proclaimed: "I now declare Haiti officially to have a power vacuum." As the world has witnessed in Iraq, Syria, and Libya, it is failed states experiencing power vacuums that provide the adequate breeding grounds for militant radicalism to emerge, and Haiti is no different. Further, and more worryingly for the stability of the entire Caribbean region, there has for the past decade been suppressed by United Nations forces in Haiti a popular movement led by one mysterious individual by the name of Guy Philippe, who in the past took part in a conspiracy to assassinate the President of Haiti's neighbor and historical foe, the Dominican Republic. The information about Guy Philippe's plot to kill a foreign head of state was suppressed at the behest of Dominican President Leonel Fernandez who feared it would lead to a "pogrom" of Haitians residing in the Dominican Republic. It was through analysis of diplomatic cables leaked to Wikileaks by former US Army Private Chelsea Manning that one of Abreu Report's editors uncovered a conversation between the US Ambassador and the Dominican President, in which Mr. Fernandez told the US official that "the snipers who were carrying out assassinations would strike again, and that he had 'downplayed' the incident because he feared that whoever had organized the ambush and assassination attempt wanted 'chaos' and 'the wholesale persecution of Haitians in the Dominican Republic.'" In that conversation between the US Ambassador and the highest Dominican official, the tension is palpable even in written form: the Dominican President had told the US official that he suspected the Brazilian General leading the United Nations peacekeeping efforts had been assassinated for refusing to crack down, at the behest of the George W. Bush administration, on street protests by people opposed to the US-backed coup which had overthrown Haiti's democratically-elected President, Bertrand Aristide. In response to the question raised by Mr. Fernandez in regards to the suspicious "suicide" of the most important military leader in Haiti, the US official assured him that there was no foul play, despite the incident having taken place just shortly before the meeting between the two. The very nature of the conversation hints at Mr. Fernandez trying to see how the Ambassador would react; it's very clear that he wondered if Guy Philippe had pulled the trigger under orders of his handlers in the Central Intelligence Agency. A decade later, and once again Haiti is in the middle of a political crisis that could see a full-scale civil war take place. This time around promises to be worse, however, due to the fact that an earthquake in 2010 destroyed much of the country's infrastructure, and a subsequent cholera outbreak has caused a potable water crisis; a water crisis which is further compounded by a drought that has doubled hunger in Haiti in the past half year alone. The country is now facing a crisis of unparalleled proportions in the Western Hemisphere, all-the-while an informal army is being raised in the shadows. Though the state army was disbanded in the 1990s, former soldiers may now be under the command of the very man the CIA used to take down former President Bertrand Aristide: Guy Philippe. "Dozens of heavily armed people in military fatigues claiming to be [members] of the former Armed Forces of Haiti traveled by motorcycle and pickup in the streets of Port-au-Prince and Delmas. A presence that has created panic in the population, fearing an intervention by Guy Philippe -- leader of the National Reconstruction Front and head of the anti-Aristide uprising in 2004 -- who recently launched a call for his supporters to resist the 'anarchists,' saying: 'We must do everything to prevent chaos in the country and I am ready to fight against anarchy.'" Before Martelly left office, Guy Philippe had already made calls to take down "anarchists," announcing that the country was "in danger" and that it was his "duty to make arrangements." Last week, Reuters reported that people did not want the "polarizing" army to return, with "anti-government protesters" beating to death one of the "veterans." As Guy Philippe prepares a guerrilla army to take power, another Washington-backed former military officer admits to raising a clandestine army. Jean Fednel Lafalaise told Reuters that "7,000 former soldiers and 6,000 new recruits" had been "trained since 2010 at bases throughout Haiti." Mr. Lafalaise said that he is "no longer" allied with Mr. Philippe because of his cocaine trafficking indictment in the United States. Although the US government recently arrested two members of Venezuelan President Nicolas Maduro's family in Haiti for drug trafficking, Mr. Philippe seems to be untouchable. As with most things Haiti, it is almost impossible to determine in exactly which way Mr. Lafalaise and Mr. Philippe are allied, or how their relationship will evolve as plans for Haiti are fully developed. Nonetheless, comments by elements surrounding them make it pretty clear that the 13,000 men army they claim to have raised will not only turn its sight on the seat of power in Port-au-Prince, but will eventually shift their objective to attacking Dominican border towns. 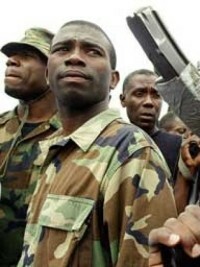 The political crisis that will ensue from those attacks will give Mr. Philippe his desired pogrom of Haitians, which he has been planning in order to further strengthen his position internationally as something more than just a petty drug dealer and warlord, but as the savior of an oppressed people. The Dominican President was almost murdered, and he feared that the same people who tried to kill him also assassinated the top Brazilian peacekeeper in the country; Guy Philippe has no limits and he's described as a master military tactician who's thinking many moves ahead in the chess board he has carved out in Haiti with US assistance. We may be in the early stages of the largest US-backed insurgency in Latin America since the Contra-Sandinista conflict which saw Ronald Reagan's proxy troops violate even "most basic standards of the laws of armed conflict."